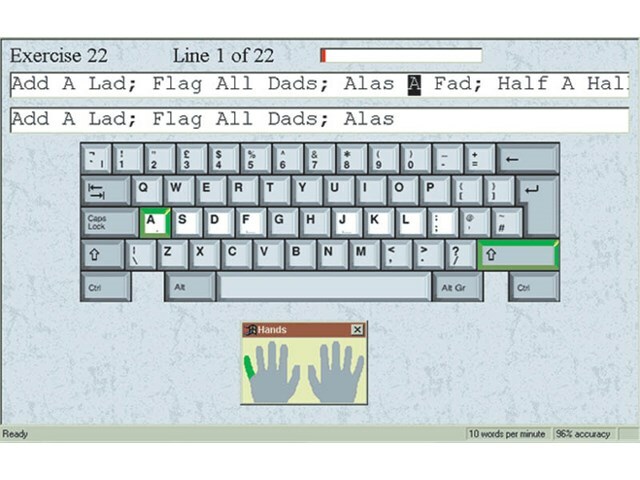 An on-screen typing tutor that works at your pace. See the letter, hear it, then type it. The software has a full picture of the keyboard on-screen, teaches the home keys first and then introduces the others through a range of exercises. Includes a monitoring system to show where you need more practice. Touch Type 2 has been designed to be both fun and easy to use, but also challenging to encourage you to use it again and again. It is also designed to optimise your practice time by giving you individual attention and accurate assessment, to ensure that you learn to touch type as quickly as possible. Touch Type 2 is easily adaptable for special needs and has a British voice! The program speaks the next letter to be typed and has the option of changing the font, font size and font colour which makes it suitable for visually impaired users. The 'key highlight' shape and the 'wrong key' are designed to be both different colours and different shapes so that they can be recognised if you are colour blind or if you use a mono monitor. Upper case letters that need the 'Shift' key to be pressed are spoken in a slightly lower pitched voice so that they can be differentiated. The 'home keys' can be located as there is a notch on most if not all keyboards on the 'F' and 'J' keys.